This year, hurricane Florence has had a decisive influence on the sweet potato market. The hurricane moved across the US and decimated the harvest in North Carolina and South Carolina. Worldwide, traders are waiting to see how the market develops. Some are switching to other origins, but not everyone is happy with the quality of, for example, the Spanish production. Egypt is no longer on the market, and Italy has a limited production. Maybe it will be necessary to look further away? Costa Rica presents itself as a producer with year-round supply and hopes to benefit from the current situation. In Australia, the market is under pressure due to a surplus. The season is completely different compared to last year's, according to a trader. Last year, the campaign was marked by a large harvest, but this year, the production in Mississippi is back to average levels. In the second half of the season, the sizes have become larger. The impact of hurricane Florence on the harvest in North Carolina will prove decisive this year. The hurricane crossed the area in mid-September; consequently, both North and South Carolina expect a smaller harvest, and that will have consequences for the market. There are rumors that traders are focusing on the domestic market this year. Exporters say they will not leave their customers unattended, despite the shortages. A grower reports to have expanded the acreage this year, but due to the hot summer and the rainy September, the yield is lower than last year. Given the lower supply, a higher price is expected this season. Although other countries, which have been supplying the product for longer, are better known in the market, Costa Rican growers point to their main advantage: year-round availability. A trader says that he has good prospects for the sweet potatoes next year. "Since there is a lower supply, there is a chance for us in the market." Exporters are mostly focused on Europe. The US market is reasonably protected. According to Dutch importers, the current market situation of the sweet potatoes from the US is certainly interesting. The season has just started, but it is already quite a challenge to get the right volumes. Also, the price of the US production is expected to go up next year, which will put pressure on the market overall. For the time being, the quality of the production from the US is good; however, it remains to be seed what it will be like after a few weeks in storage before they are shipped, then we will see the actual extent of the damaged caused by the hurricane. Spain is currently having a very difficult time due to the weather. A lot of rain is being recorded, so drying and shipping the sweet potatoes is a challenging task. The few who dare are often struggling with quality issues. Others are waiting patiently for the weather to improve and will start loading again next week. Egypt has also stopped after a single container. They have had a good season and were able to take advantage of the price increase and low supply a few months ago. The plan is to start planting earlier, as a market gap is expected by the time the US runs out, which may happen around June/July. The British market has a scarce supply of sweet potatoes. The Egyptian season has been completed and there are some small volumes from Spain on the market, but the quality is disappointing. Sweet potatoes are also imported from Honduras, but traders are also not happy about their quality. Furthermore, traders don't have great prospects when it comes to the volumes coming from the US. They expect a short season, given that 30% of North Carolina's production has been damaged by a recent hurricane. The price for US sweet potatoes is higher than normal and it continues to rise every day. Normally, the US has sweet potatoes until July, but according to some growers, stores will be under-supplied already in spring. This will create a big market gap and there is no way to fill it. Maybe some small volumes from South America will be available during that period, but the Egyptian season does not start until July. At the moment, the demand exceeds the supply. Most of the sweet potatoes on the market come from the US and Spain. A trader in the south of Germany states that he has just received information about the American season. "Due to unfavorable harvesting conditions, there will be a lower volume available. This is a consequence of the hurricane season in the US, which causes sweet potatoes to have a lower quality and shorter shelf life." The trader expects to be able to continue with the Spanish supply until the end of January. Due to this shortage, traders are considering importing from countries that are not normally on their list, such as Egypt and Central America. Sweet potatoes from these areas are not very popular among German consumers. "It seems that we'll have to make more use of this option than we'd normally do." Prices are stable at around 1.25 to 1.30 Euro per kilo, depending on the size. There is no peak in the marketing during the Christmas season, as many other products are available during that period. The arrival of Spanish sweet potatoes on the French market has brought prices down considerably. According to an importer from Rungis, they have been halved, because Spain has a great production and sells a lot on the European market. Before the Spanish production was available, the trader was offering products from the Southern Hemisphere. The prices stood then above € 1 per kilo. Now, however, they are down to around € 0.50. Only the Beauregard variety, which is popular on the French market, is sold for a better price: € 0.80 per kilo. Also, France is gradually growing more and more sweet potatoes. Various traders say that this is becoming a successful business. Despite the Spanish competition, the product is sold for good prices. Consumers are simply prepared to pay extra for domestic products. There is strong competition from Spain for Italian sweet potato growers. Nevertheless, the Italians state that their product has a better shelf life, appearance and quality than the Spanish. Besides, there is also competition from Israel and the US. The acreage is expanding, mostly in Puglia, but in other parts of the country, too. The crop's cultivation is becoming more popular. Since Spain and Israel are still on the market, the prices are low. Nevertheless, the season in Puglia is going well, even though there were a few days with a lot of rain during the harvest. Growers look for varieties that are more resistant, but these are still in the experimental phase. This year, both the demand and the supply have been increasing. Sweet potatoes are increasingly popular among consumers and the product is hitting more and more market and supermarket shelves. 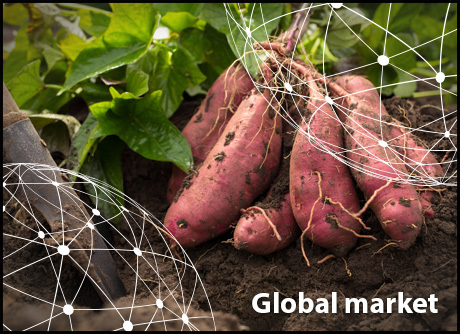 The large supermarket chains mainly opt for the cheaper Spanish sweet potatoes, while the smaller supermarkets prefer the Italian harvest, which has a price of 1.40 Euro per kilo. A project has been started in Piedmont for the development, promotion, improvement and protection of sweet potato cultivation in the Caraglio-Bernezzo-Cervasca area. So far, small volumes have been cultivated in the area in complete harmony with nature. A small volume is already available through the farmers markets. The sweet potato market is a growing market in China. The product is very popular among Chinese consumers and the price remains stable. For this reason, many growers have expanded their sweet potato fields, so the production this year is also somewhat higher than last year. In October, when the season had just started, prices dropped, because there was a lot of supply on the market at the same time, but they are now again back to normal. The current harvest season kicked off in August and is now almost finished. The supply of Chinese sweet potatoes lasts until February; that's also when the season ends. Chinese sweet potatoes are also exported to other Asian countries, such as Vietnam, Thailand, Myanmar, etc. A grower in Queensland reports low prices for the sweet potatoes due to a surplus of the Gold variety. With the start of the new harvest in January/February, he hopes that the market will also pick up. In contrast to previous years, this year's season has been fantastic, with few losses. In previous years, the revenue was limited by the weather. Moreover, the new Bellevue variety has proven to be one with an extremely high yield. New growers are planting this variety and others are expanding their existing acreage. According to the most recent figures from Hort Innovation, 60,148 tons were harvested in the year ending in June 2017, 2% of which was supplied to the processing industry. The value of the production reached 60.5 million dollars, an increase of 51% compared to 2016. Australia exported 866 tons of fresh sweet potatoes. Almost half, 49%, were shipped to the United Arab Emirates. Australia's sweet potato cultivation concentrates in Queensland. There are also some growers in Western Australia and in the north of New South Wales and the Northern Territory. Sweet potatoes are available year-round, but the supply peaks towards the end of the summer and during the autumn months.